With Christmas just a few weeks away, we take a look at some fun and creative ways to use artificial grass inside and outside the home this Christmas. Make a mat using artificial grass to cover the base of your Christmas tree. All of our fake grass products can be cut down to any size and shape, so if you have an awkward corner or alcove that your Christmas tree stands tall in, or perhaps you just want to enhance the appearance of your Christmas tree set-up, an artificial grass mat could be the finishing touch you’re looking for. You can even add a dusting of fake snow or silver spray paint for a glistening snow-like effect. 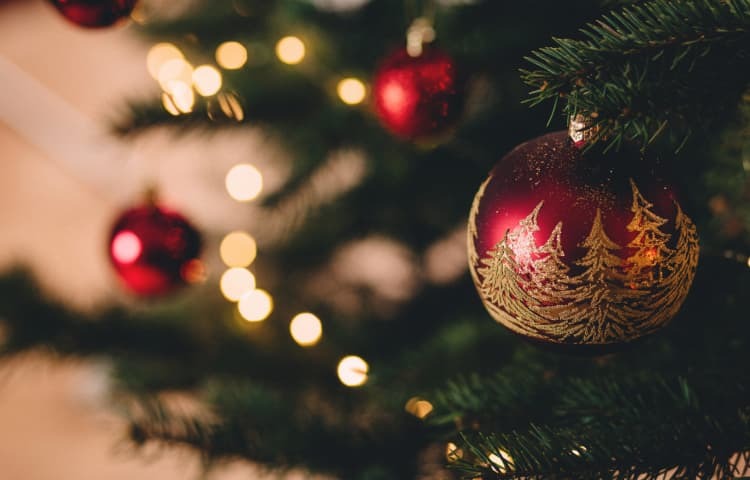 If you prefer to have a real Christmas tree, an artificial grass mat will capture the pine needles as they fall, saving you the time and effort of having to clean them up regularly. What’s more, when Christmas is over, you can just shake the mat over the bin before rolling your artificial mat away for the following year. Artificial grass shaped animals are a fun and playful way to bring a splash of festive colour to the inside and outside of your home. Why not try a nativity-themed donkey or sheep, or create Rudolph the reindeer with a red-lit nose? And if you really want to go all out, you could have all eight of Santa’s reindeer! If you want to create a winter wonderland, then perhaps a polar bear or penguins are more suited to you. Cast a net of twinkly lights over your animal shape and you’ll have the perfect outdoor Christmas decorations come day or night. Are you hosting the big family Christmas dinner with all the trimmings? We’ve got the perfect piece for your table decoration that won’t go unnoticed by your guests – an artificial grass table runner. Artificial grass can be cut to any size and shape so whether you need it to run the length of a table, or just need a centre spot for your round dining table, anything is possible. Here are a few of our favourite suggestions for creating an eye-catching centrepiece for your dining table this Christmas. Pine cones offer so much diversity when it comes to decoration. Simply leave them as they come for a rustic and natural feel, or why not let the kids get creative by painting them, dipping them in glitter, or topping them with a dusting of spray-on snow? Scatter them across your artificial grass table runner and you’ve got yourself a piece of the outdoors in the comfort of your home. You can create centrepieces upon your grass runner by entwining twigs from the forest around scented candles with a few sprigs of holly, a touch of ivy, and some red berries. Christmas is all about sparkle so why not give your artificial grass table runner a sprinkling of glitter or place some bright and colourful baubles down the length of the runner to complement your theme or colour? Scatter some small crystals or diamantes over your grass table runner and place some candles along the stretch of luscious green. The crystals and diamantes will reflect the light from the candle flame, creating some added twinkle around the room. Make some topiary balls using artificial grass. They are perfect for hanging outside your front door all year round and can easily be given a festive twist for Christmas. Add some bold red berries, hang using silver or gold ribbon, or why not cover with a net of lights to make an illuminated feature that will shine brightly at night to help Santa find his way? If you fancy a little DIY project this Christmas, then try making a festive wreath for your front door or a centrepiece for your Christmas-themed dining table. You won’t need too much artificial grass to make one, so if you have a few off-cuts left over from your Christmas tree mat, there’s no point in letting them go to waste. Decorate your grass-effect wreath with festive berries, flowers, cinnamon sticks and ribbon for a totally unique Christmas decoration. Instead of a door wreath, why not opt for an artificial grass covered snowflake with a dusting of fake snow and glitter? Simply tie a piece of metallic ribbon and hang on your front door. It’ll get all your visitors attention and they’ll soon be asking you where you got it from! Children enjoy playing out in the garden so much, why not give them a place to play that resembles it indoors over the Christmas holidays? Fake grass can be trimmed down to a suitable play-mat size or why not install an artificial grass carpet in their playroom? Not only will our fake grass products stay vibrant and green all year round, but they provide a soft and durable surface that is soft to land on and easy to clean too. We hope you enjoy re-creating some of our fun and inspiring ways to use artificial grass this Christmas. We'd love to see your creations so when you're finished, make sure you share your projects with us on Facebook or Twitter. For all artificial grass enquiries, please contact a member of the Unreal Lawns team.